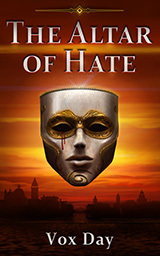 THE ALTAR OF HATE is a collection of 10 short works of fiction by Vox Day, the Hugo-nominated author of QUANTUM MORTIS and THE ARTS OF DARK AND LIGHT. From the fantasy novella “The Lesser Evil” to the Maupassant-inspired techno-horror of “The Logfile” and the military science fiction of “Medal for a Marine”, THE ALTAR OF HATE demonstrates Day’s eclectic range as well as the deeply esoteric nature of his interests. EPUB or MOBI format. No DRM. 118 pages.